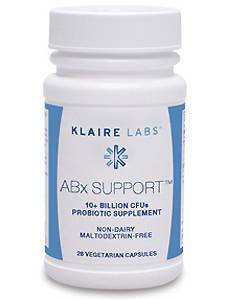 ABx Support is a carefully researched blend of the non-pathogenic yeast Saccharomyces boulardii with Lactobacillus rhamnosus, Bifidobacterium bifidum, and Bifidobacterium breve, probiotic microorganisms documented to support the normal gastrointestinal flora during antibiotic therapy. S. boulardii has broad, versatile gastrointestinal effects. 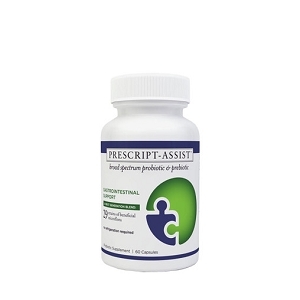 It stimulates numerous intestinal brush border enzymes to maintain normal digestive functions, secretes many factors including enzymes that may reduce dietary protein allergies following gastroenteritis and polyamines that stimulate brush border hydrolases, proteases, and transport carriers. It stimulates D-glucose and sodium absorption and produces short-chain fatty acids such as butyrate and acetate that nourish colon mucosa. S. boulardii enhances the numbers of healthful bifidobacteria in the colon while simultaneously suppressing populations of pathogenic clostridia. 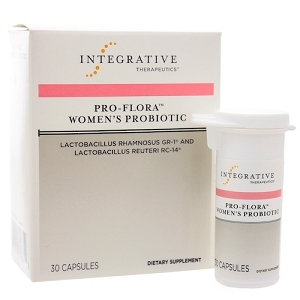 L. rhamnosus is a transient Lactobacillus that colonizes the small intestines when regularly consumed. It favorably enhances innate and acquired immunity. It decreases T cell proliferation, induces helper (CD4+) T cell hyporesponsiveness, increases phagocytic activity in peripheral blood white cells and killing activity in natural killer cells, and inhibits production of proinflammatory cytokines. L. rhamnosus significantly augments serum and mucosal secreted antibody responses. B. bifidum and B. breve are two species indigenous to the colonâ€™s microflora. Bifidobacteria are highly beneficial for normal bowel function and are exquisitely sensitive to most antibiotics. 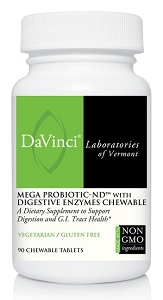 Consumption of B. bifidum and B. breve replenishes colonic bifidobacterial populations suppressing overgrowth by pathogenic microbes such as Clostridium difficile and Candida albicans. B. bifidum is among the many Bifidobacterium species normally found in large numbers in a healthy colon microflora. B. bifidum activates B cells making them more responsive to transforming growth factor-1 and interleukin-5 for IgA secretion. B. bifidum enhances IgA response to C. difficile toxin A. Supplementation with B. bifidum enhances white cell phagocytic activity. B. breve increases the immune response of Peyer's patch cells stimulating B cell proliferation and antibody production. 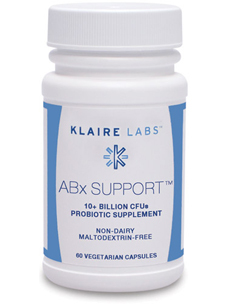 Clinical studies of the probiotic species in ABx Support have shown these microorganisms support against antibiotic-associated diarrhea, C. difficile bowel disorders, and rotavirus diarrhea. 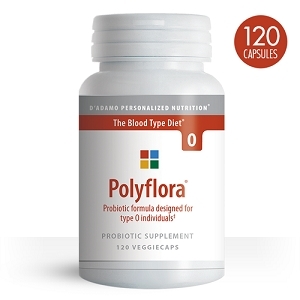 Other Ingredients: Inulin base derived from chicory root, vegetarian capsule (hydroxypropyl methylcellulose, water), and L-leucine.